THERE WILL BE NO PARTICLE ASTROPHYSICS SEMINAR THIS WEEK 3:30 p.m. Hot on the heels of the Daya Bay experiment's completion of one of the most difficult measurements in neutrino physics, a Korean experiment has produced its own measurement confirming the earlier results. Scientists at the Reactor Experiment for Neutrino Oscillations, or RENO, studied neutrinos emitted from six reactors at the Yonggwang nuclear power plant on the west coast of the Korean peninsula to observe the rarest type of neutrino transformation. This allowed them to measure a variable called theta one-three. The larger the measure of theta one-three, the more often electron neutrinos and electron antineutrinos oscillate, or change from one type to another. 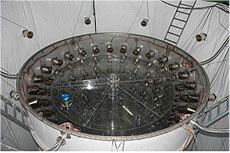 The experiment calculated theta one-three to be about 0.10, similar to the Daya Bay experiment's calculation of 0.09. Editor's note: Fox Valley Repertory collaborated with Fermilab staff to create the Collider New Play Project. Fox Valley Repertory recently accepted 2 new awards on behalf of their excellence in community awareness – the Illinois Alliance for Art Education (IAAE) award for promoting arts education, and the St. Charles Chamber of Commerce Community Image Award. In 2011, the St. Charles-based theater changed its name from Noble Fool Theatricals to Fox Valley Repertory; a name that better represented the community they have grown their mission, vision, patron base, and academy students around. As the nonprofit theater company in residence at Pheasant Run Resort now for the eighth year, "we are focused on creating an engaging theater experience by producing shows that inspire our community to laugh, reflect and reconnect to moments in one's life," says Artistic Director John Gawlik. A major portion of their commitment is through arts education. With the most extensive offering of academy programs, they hope to continue to inspire youth to explore their own lives through the performing arts. In one of the press conference here, a panel of experts spoke on this topic, and the panel included a Nobel Laureate and officials from the Department of Energy. Everyone wanted to ensure that physics research maintained a prominent role in the U.S. 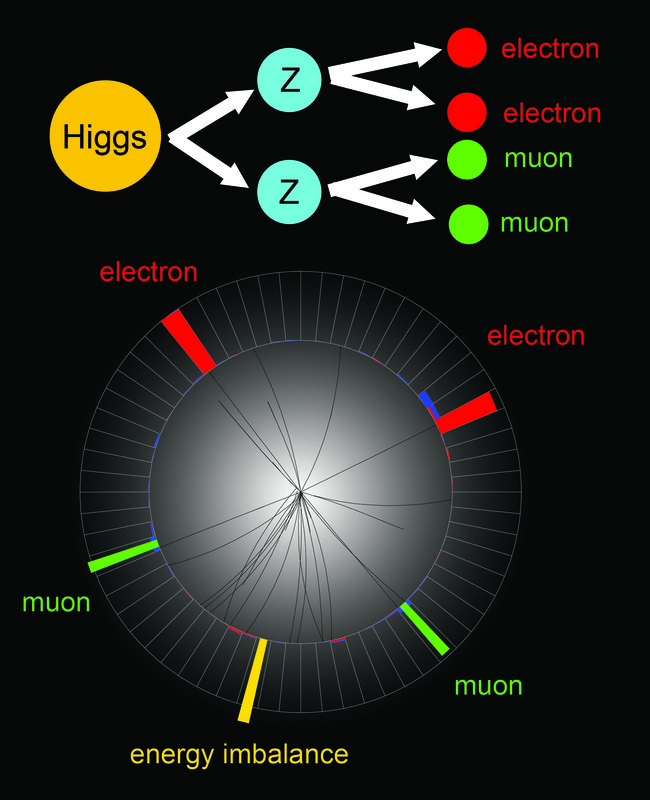 This DZero event is not thought to have come from a Higgs boson, but an event in which a Higgs boson decayed into a pair of Z bosons would look very similar. If we find the Higgs boson, we won't see the particle itself. Instead, we will see its decay products interacting with the detector. To find out if the original particle is the Higgs, we do particle physics forensics. If Higgs theory is correct and it exists in the suspected mass range, the Higgs boson has a lifetime of about 10-22 seconds. 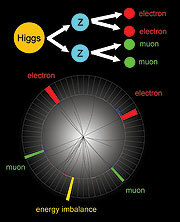 Even if it is moving at nearly the speed of light, the Higgs boson will travel a distance only a few times the size of a proton before it decays. That's too quick for us to observe, so we have to look at the end result. For simplicity, let's say the Higgs boson decays into two Z bosons, even though that's rare in that mass range. If one Z boson decays into an electron-positron pair, while the other Z boson decays into a matter-antimatter pair of muons, we can see the relatively stable electrons and muons in the detector. If we only see the electrons and muons, how do we know what started the decay chain? Referred to as the parent, the original particle decays into daughter particles, their decay products are granddaughter particles and so on. To determine the original ancestor, we exploit basic energy and momentum conservation laws. The generations have exactly the same energy and momentum, since energy and momentum are conserved. For instance, if we take the two muon granddaughter particles and precisely measure their energy and momentum, we can combine them and determine the energy and momentum of their parent, one of the Z particles. Do the same for the other Z particle, and we can combine the energy and momentum of the two daughter Z bosons to determine the energy and momentum of the parent particle that might be a Higgs boson. Click here to read the expanded column on how decay products lead to the original product. Want a phrase defined? Have a question? Email Fermilab Today.